The ASUS X72D is an interesting beast and a testament to just how far prices have fallen on Blu-ray capable hardware. It also gives us the opportunity to play with a triple-core mobile AMD chip, something we haven't yet enjoyed on the review bench. While a mobile Phenom II and Mobility Radeon HD 5470 may not be the most exciting pieces of kit in the world, they can be used to buttress an attractive and affordable build able to handle most computing tasks without breaking the bank. Today we'll be figuring out just how well three AMD cores can compete with two hyper-threaded Intel cores at the entry level, and whether or not the X72D delivers the solid multimedia experience it was intended for. Note that our review model is labeled X72D, but it's the same design as the readily available K72DR--only with Blu-ray and a 7200RPM drive compared to the stock model available at Newegg. We'll refer to the notebook as the X72D throughout this review, but the two names are synonymous--the X72D is just the upgraded model. Here are the specs of our review sample. Even if it isn't that exciting, the most interesting part in the X72D is the AMD Phenom II N830 at its heart. AMD processors have been somewhat rarefied around here since manufacturers are typically more interested in throwing flashier, more exciting Intel-based units our way, so it's nice to get our hands on one of AMD's faster tri-core mobile chips. The Phenom II N830 runs its three cores at 2.1 GHz and is basically a mobile, power-binned version of the L3 cache-less desktop Athlon II X3. While these cores aren't as fast clock-for-clock as competing Intel chips, they're fast enough, and a healthy jump over AMD's old K8-based mobile chips. There's still a major stumbling block for AMD in terms of power consumption, though: an AMD-based notebook has to power both a northbridge and a southbridge, while most of this functionality is either handled by integrated hardware in Intel's mobile processors or by the single power friendly HM55/PM55 chip. It's not a case of just having more chips, but when you look at the manufacturing processes in use and the historical data, AMD hasn't done well on getting power use in check. Having to run three of their chips compared to two of Intel's chips is going to be a big hurdle. 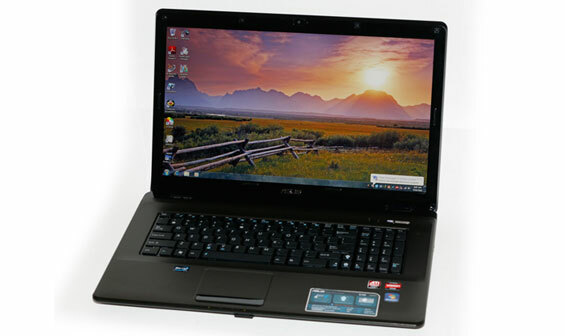 The odd choice is the ATI Mobility Radeon HD 5470 dedicated GPU. Given the 17" chassis we would've liked to see at least a Mobility Radeon HD 5650, but what makes the anemic 5470 even more puzzling is how aggressive of an implementation it is. While the chip itself is still the same dismal DX11 rehash of the old 4300/4500 series, plugging along with just 80 stream processors and a paltry 64-bit memory bus, ASUS has opted to clock it at a staggering 750MHz. As has become customary with low-end chips, the 5470 has also been outfitted with 1GB of DDR3—about 512MB more than it could ever use—clocked at a healthy 1.6 GHz effective. This is pretty much as good as the 5470 is going to get, but that isn't saying much. For comparison we have the Dell Studio 14 in our charts, which uses a 5470 at a lower 675MHz core clock. The remainder of the X72D is fairly healthy. 4GB of DDR3 is clocked at 1333MHz instead of the usual 1066MHz, and ASUS saw fit to equip the unit with a 500GB, 7200 RPM Seagate hard disk. 5400 RPM drives are starting to phase out of the ASUS lineup, and that's a good thing. There's also a combination Blu-ray reader, DVD writer, suggesting the X72D's intended market, but that Blu-ray drive is only going to be pushing a 1600x900 screen—no 1080p for us. What's puzzling is the lack of eSATA, USB 3.0, FireWire, or ExpressCard. Any one of these would be excellent for external storage, but apparently we're stuck with USB 2.0 still. This is even more bizarre when you recall the concerted push ASUS was making to add USB 3.0 to all of their hardware. "There's still a major stumbling block for AMD in terms of power consumption, though: an AMD-based notebook has to power both a northbridge and a southbridge, while most of this functionality is either handled by integrated hardware in Intel's mobile processors or by the single power friendly HM55/PM55 chip." Considering that there is a separate, 45nm chip fitting the exact definition of the traditional laptop northbridge chip in the dual-core Core iX CPU package, and that the Core 2 platform, with its multiple "inefficient" and "obsolete" chips still seems to be untouchable in battery life, that statement is riding a fine line between silliness and misinformation. Since this is a laptop offering SATA 6Gbps, i strongly suggest you run a bench round with C300 128/256GB in it. It would also be nice to see the PCmark scores of that compared to the original configuration and the competition. (3x2.1GHz, 45nm, 1.5MB L2, 35W)"